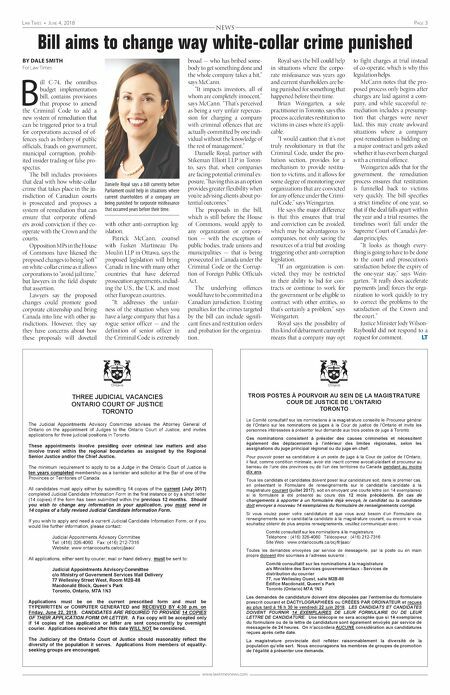 Page 2 June 4, 2018 • Law Times www.lawtimesnews.com NEWS © 2017 Thomson Reuters Canada Limited 00248GI-89614-CM AVAILABLE RISK-FREE FOR 30 DAYS Order online: store.thomsonreuters.ca | Call Toll-Free: 1-800-387-5164 | In Toronto: 416-609-3800 Stay informed on the latest issues in Canadian environmental law Order # L7798-8085-65203 $173 Hardcover approx. 450 pages November 2017 978-0-7798-8085-0 Shipping and handling are extra. Price(s) subject to change without notice and subject to applicable taxes. Emerging issues shaping Canadian environmental law are at the heart of this new publication. Who more qualified to discuss them than the lawyers who have been involved in litigating the leading cases? Now you can inform your legal advice with the unique focus offered by Litigating Canada's Environment: Leading Canadian Environmental Cases By the Lawyers Involved. Gain expert perspective on climate change, the intersection of environmental and energy issues, Aboriginal rights and the environment, energy facilities (pipeline regulatory decisions), environmental impact assessment, public inquiries, and much more. Each contributor discusses the broader context of their case and the litigation strategy used, as well as the longer term significance for environmental litigators, regulatory lawyers, and policy makers. 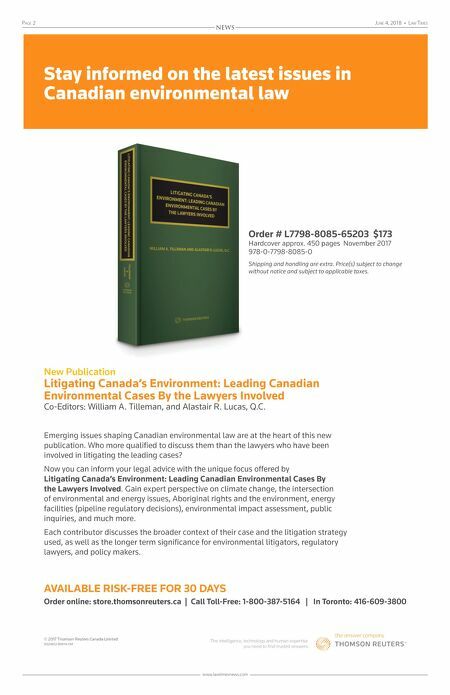 New Publication Litigating Canada's Environment: Leading Canadian Environmental Cases By the Lawyers Involved Co-Editors: William A. Tilleman, and Alastair R. Lucas, Q.C.